David Ivey is a British wildlife sculptor of international renown. Born in Kent and raised in Mid-Wales, the rural life has always been of paramount importance for David; for the ample variety of wildlife, flora and fauna provides the vital inspiration required to create such exquisite sculptures. He currently lives and works in West Herefordshire in the shadow of the Black Mountains where he continues to draw on the inspiration provided by nature. He first gained a qualification in Industrial Ceramics from Hereford College of Art before going on to a career in the china trade producing bone china figurines. 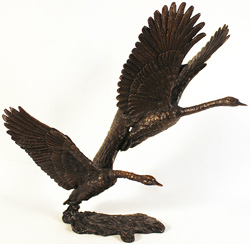 It was at this time he first began sculpting wildlife subjects and developed his passion for depicting birds and animals. As a self-employed sculptor he has worked for many famous names in the giftware industry over the years, including Boehm of Malvern, Hereford Fine China, Heredities, Wildtrack, Country Artists, Franklin Mint, Birmingham Mint and Border Fine Arts. He continues to pursue his ambition to simply ‘capture the beauty and essence of the subject’ with each and every one of his sculptures, and as a result, continues to produce work of illustrious calibre treasured by all. Please note that all David Ivey art listed in this section has previously been displayed for sale and is not currently available.